CON-TROL-CURE® T8 T12 UV FILTER SLEEVES or fluorescent bulb jackets are flexible plastic filters designed to fit over any standard fluorescent light tube. Amber Sleeves or bulb jackets filter UV light up to ~500nm (between 475nm - 500nm, filtration is not 99%. Please refer to TDS for charts), Clear Sleeves up to 400nm. No tools are required for installation. The UV Inhibitor in UV Filter Sleeves never wears out and never needs replacement. The 48" amber UV blocking Filter Sleeve is made of polyester and can withstand high heat. 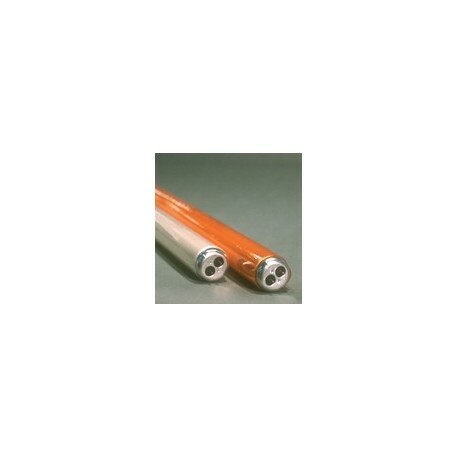 The CON-TROL-CURE® T8 T12 UV FILTER SLEEVES are available in 4' lengths in both clear or amber. Use 2 sleeves to cover an 8' fluorescent bulb jackets. Just remember to remove when changing lamps. Popular applications include: UV laboratories, above printing presses, ink formulation areas, ink storage areas, warehouse for cured products, Libraries, Museums, Photosensitive reactive prevention and Semiconductor and printed circuit production. Protect your displays and storage areas from the fading, bleaching and deterioration caused by the ultraviolet light from fluorescent lighting. The maximum service temperature recommended for polyester films in general is 150C (302F). Where extensive exposure, severe environmental conditions, or unusual physical requirements are involved, it may be necessary to reduce service temperatures to extend useful service life. Amber sleeves will absorb more heat than clear, therefore close monitoring of these sleeves should be performed, especially on light sources labeled HO or VHO (High Output or Very High Output). When in doubt, always check the temperature at the ends of the light source you wish to cover after one hour of operation, to ensure it operates at a safe temperature.